remember that baba ghanoush i posted last week? if you made a little too much and are tired of eating it with pita and crudites and on toast and pizza and everything you can think of, or if you want a little bit more veggie power packed in (did you know eggplant doesn’t have much nutritional value? thanks for nothing, eggplant), then hi. hello. wassup. this roasted broccoli salad transforms the aforementioned baba ghanoush with roasted broccoli tossed in a tangy vinaigrette, and the whole shebang gets sprinkled with cilantro and toasted nuts. if that doesn’t scream LOOK AT ME I’M HEALTHY, then idk what does. you get the silky eggplant but also crisp-tender broccoli. the almost richness from the bit of tahini in the baba ghanoush, balanced with the acidity of the dressing, which also has a bit of cumin (which i think of as a spice with a lemony but also kind of reminiscent of indian food flavor). there’s the crunch of the almonds, and fresh herbaceousness from the cilantro. force feed your fam if you must, but make them eat the roasted broccoli salad with baba ghanoush all together. the separate parts are good but not great, but when you combine them, you will convert (most of; my picky “i subsist on granola bars and chicken nuggets and cheddar” brother is not convinced) the haters. Brush eggplant on all sides with some oil, season with salt and pepper, and place cut side down on a rimmed baking sheet. Roast at 350F until lightly browned and softened, 30–40 minutes. Cool until you can handle it comfortably, then peel the skin off. Meanwhile, heat a medium cast-iron skillet over high heat. 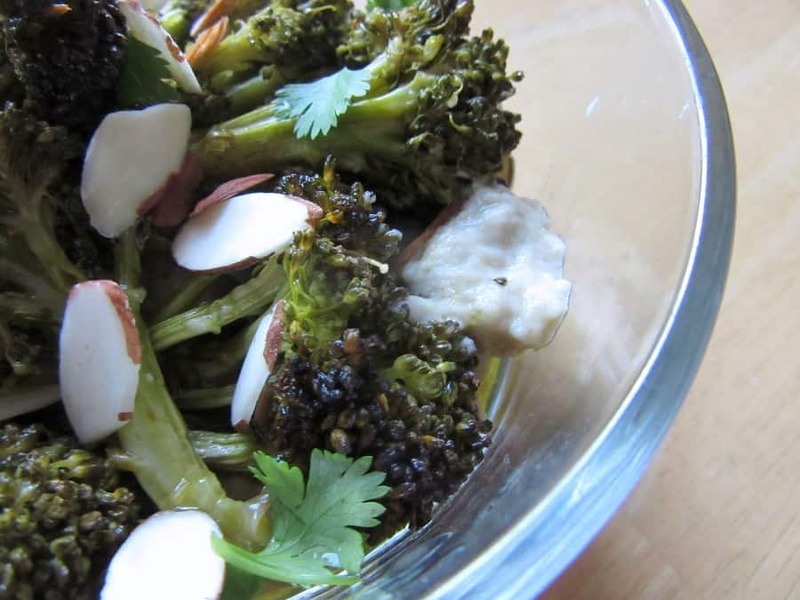 Cook broccoli, tossing occasionally, until surfaces are blackened, 10–15 minutes. Transfer to a large plate; cool. You could also do this in the oven, but it won’t char quite as well and will take longer (20+ minutes at 350F). Toast the cumin in a dry small skillet, tossing often, until fragrant, about 4 minutes; let cool. Transfer to a small bowl and whisk in the vinegar, 1/4 cup oil, 1 T lemon juice, and 2 T water; season with salt and pepper. Blend the eggplant flesh, tahini and 2 T lemon juice. With motor running, stream in remaining oil; process until smooth. Season with salt and pepper. Toss broccoli and vinaigrette in a large bowl. Serve over baba ghanoush topped with cashews and cilantro. Yaaas I remember that babaganoush post…and roasted broccolini is my fave go-to vege dish at the moment (so easy!!) so ahhhh I can just imagine the 2 together would be so good. And although I love the sound of it, my way-too-picky brothers still can't stomach eggplant either. So frustrating! my brother is notoriously picky as well, so whenever i end up cooking dinner, i make sure there’s leftovers or something in the freezer that he’ll eat, lol. or for this one, i separated out some plain broccoli for him, and gave everyone else the full shebang.